US marines killed lying face down in the sand of Omaha Beach, Normandy, France. Crossed rifles in the sand are a comrade’s tribute to this American soldier who sprang ashore from a landing barge and died at the barricades of Western Europe. The D-day Omaha beach Allies faced with the strong resistance of the enemy: to the end of the day the Americans lost about 3,000 soldiers there, while in the area “Utah” was only 197 killed. 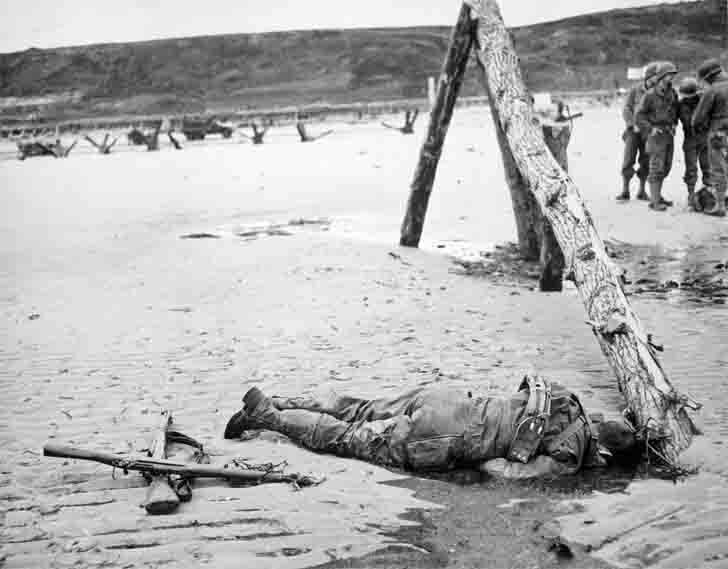 Source: Crossed rifles in the sand are a comrade’s tribute to this American soldier who sprang ashore from a landing barge.